Thanks for the input, Andrej. Have you allowed for the East side of the TSBD building to be approx 15 degrees west of North? I have to say that I am not calculating anything to emulate the shadows - the computer does it. The exact geographic location and the location of the sun at any instant is provided by the GoogleEarth program. GoogleEarh and SketchupPro are both produced by Google and therefore linked internally. I have checked the shadows suggested by the Sketchup+GoogleEarth machinery with shadows seen on a number of doorway pictures (Allen, Murray), and found a good match in all cases. It is a bit tricky to verify the shadow produced by the SketchupPro model with Darnell's stills as we do not see the floor shadow in Darnell's stills, only the shadow on the horizontal rail. However, this shadow is a mixture of both the shadow cast by the western wall and the shadow cast by the ceiling. In spite of these limitations (mixed shadows and low signal in this part of the doorway), there is a slight hint even in the Darnell's still that the shadow was actually about 1 foot to west from the vertical door rail. The picture below was also posted at the Reopen Kennedy Case forum a while ago, I hope it is all right to post is on this forum as well. It shows (A) a cut of Darnell's still which does not offer any indication as to where the shadow cast by the western wall would be. In (B-C) the contrasts have been increased in two steps. The C panel shows a transition between a bit brighter and a bit darker part of the rail about a foot away from the vertical rail. In D, the aligned 3D shadow line crossing the bottom horizontal rail is shown. The yellow line crossing all four panels would be the shadow line inferred from ©. I am aware that this reconstruction entails some deliberate contrast operations made with the original picture, however, this is the best I can offer to indicate where the shadow cast by the western wall would be in Darnell's stills. There is a small mismatch between the model and the line obtained by contrasting Darnell's still of about 1 inch. I would disagree about the left wall shadow being identifiable in Darnell. As this was an hour and a half after the Darnell photo, the sun would have moved about 22.5 degreesW. This appears to agree with the angle of the yellow line. I would estimate that the shadow line at 1.31 p.m. would be to the right of the left door post. Allen's picture showing three ladies leaving the Depository is a great photograph. I think it was taken around 2.10 (maybe even few minutes later), at least my model gives the best match with the picture at about this time. The problem is that the picture does not show the bottom rail of the door frame which makes it difficult to verify both shadow lines, yours as well as mine. Further, human figures, those on steps and also those standing in front of the doorway (and casting their shadows whilst themselves not seen in the picture) also confound the shadows. Yet, your estimate (green line) appears to be pointing too far towards the eastern (right when viewed from the front) wall. One source of the discrepancies between our estimates may be the quality of the drawing onto which you plot your calculated angles which I am confident are all right. 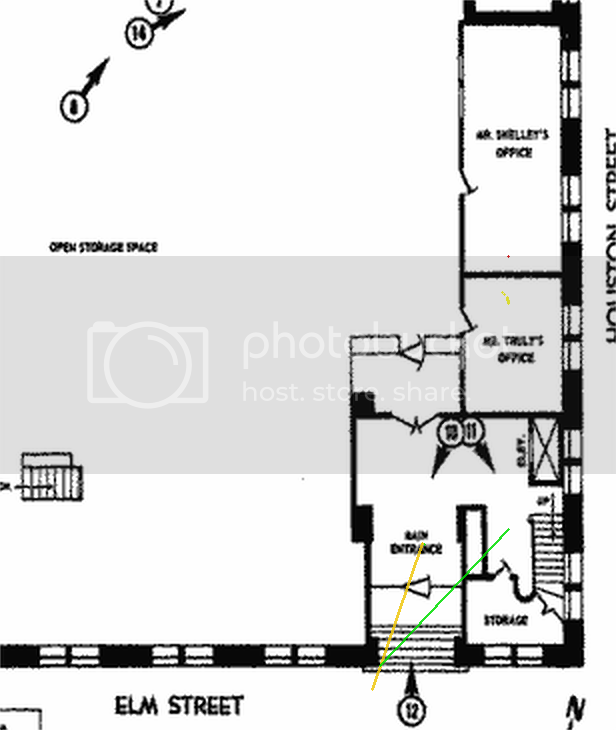 For instance, there are seven steps in the doorway, yet the layout shows only five steps. The top landing appears to be too deep compared to the reality. I assume someone took accurate measures of the Depository and plotted a plan on a sheet of paper, which was then again compressed to fit the size of a book page. If this compressed scheme of the Depository is again enlarged, it may not be as accurate as the original measures. You could well be right about the sketch I was using, Andrej, but using the layout from the W.C. Report shows a similar result to the first sketch. 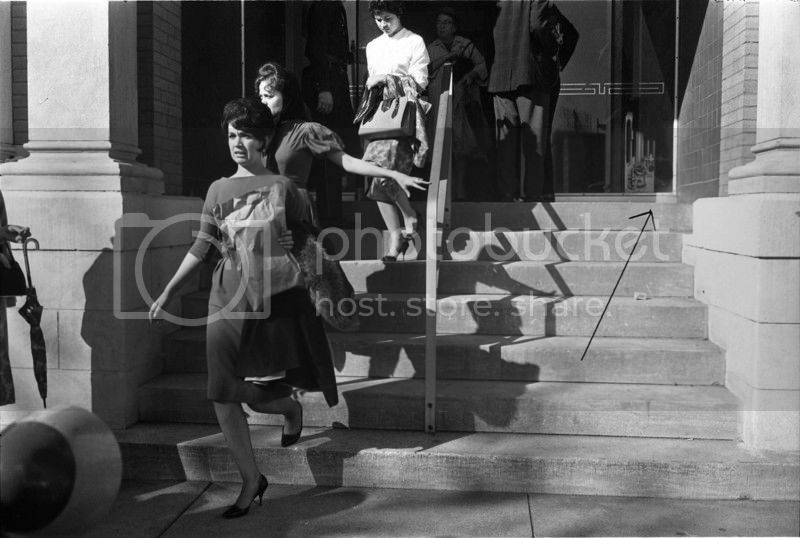 The shadow of the wall, on the second step down (alongside the right foot of the girl in the white blouse.) is further to the right on the photo than it is Sketchup. The black arrow shows where the shadow hits the bottom of the glass partition.IMO. 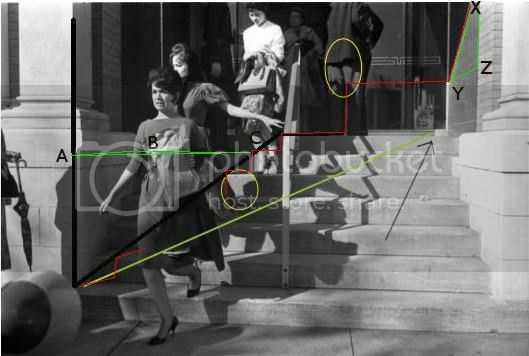 Maybe one of our forum members who live in Dallas could go down there tomorrow and take a photo of the TSBD steps at 12.39 p.m. when the sun azimuth matches that at 12.30, 11.22.63, and this would show where the shadow actually is. I confess I have overlooked the corner part of the bottom rail which shows a slightly greater brightness than the rest of the rail. However, does this bit of the rail really mark the shadow line? It can also be a slightly different, maybe stronger, metal plate holding the junction of two rails. 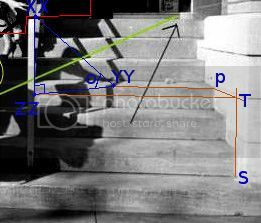 If the shadow line would indeed be that far to the right (when viewed from the front), there could not be the bright areas on the steps or on the figure standing on the top landing. The green line in the picture below would correspond to your proposed shadow line. However, the spots delineated by the yellow ellipses would also need to to be in the shadow. The shadow line is actually only a 2D projection of the shadow plane onto the surface of the steps and top landing. Your idea to get some real doorway photographs with known time of shooting is great. However, the doorway has been rebuilt and unfortunately the dimensions of the top landing do not hold anymore. Thus, I could only comment on the shadows on the steps. It would still be helpful to compare out shadow estimates with template pictures having a time stamp. I appreciate your comments and ideas on this important issue, The doorway shadows make good service in estimating the locations of different people in the doorway. If not the shadows, the number of possible reconstructions which would equally well represent the doorway scenes in various films or photographs would be just too large. At first look I think you need to establish the angle between true north and line A-B. (triangle abc horizontal) This plus the angle between line A-B and line A-C gives the westward angle of the sun. The angle between X-Y and Y-Z gives the elevation of the sun and a sun chart of the date, lat, long, will give the time of day. edit add: a few corrections. A bit quick off the mark there. You need to establish true north. The variation of it and the line ab (which may be a subtraction or addition to angle between ab and ac) and adding 180 degrees gives degrees west to sun. The angle of elevation is along the sight to sun rather than at angle of wall as marked. The 'idea' is right but there's not enough info on that pic to say. ** Need to zoom out or find another pic taken at same time. The Doyle height argument conclusively refutes Murphy's thesis that PrayerMan is Oswald. By way of analogy, this latest sun-shadow analysis is like adjusting mannequins in the display window while the department store is being engulfed by a fire in the rear. the landing is 4 ft x 11.5 ft; PrayerMan & Frazier are set at the front edge of the landing, 1.5 ft & 5.75 ft (midpoint) from the west wall. A 20-degree line is drawn through PrayerMan, from the intersection of the west wall & glass partition, out into the street. This is the PrayerMan-Darnell line. A Frazier-Darnell line of 23 cm (which corresponds to 46 ft) is constructed, intersecting the PrayerMan-Darnell line. This gives a Frazier-Darnell-PrayerMan angle very close to 5.0 degrees. This gives a PrayerMan-Darnell measure of 23.5 cm (i.e. 47 ft). Hence there will be a correction factor of 47/46 when comparing PrayerMan & Frazier's measured heights. From previous work, I obtained a full-page blowup of PrayerMan's entranceway area at the local library. Using the brightly-lit top step as a guide (at p. 517 the last post at Who is Prayer Person?http://www.jfkassassinationforum.com/index.php/topic,8916.4128.html)I construct a horizontal line representing the landing. From this landing I measure Frazier's height as 5.2 cm, and PrayerMan's height as 4.5 cm. Since Frazier is 6-foot tall, PrayerMan approximates as (4.5)(47/46)(6/5.2) = 5.3 ft or 5 foot 3 3/4 inches. Since PrayerMan is at the front edge of the landing, basic trigonometry places the radiator approximately 4.25 feet behind him. If we set PrayerMan at 47 feet from Darnell's camera, the radiator is 51.25 feet from it. I have only 3.3 kB of alloted graphics-posting space left and am unable to post even my 10 kB entranceway graphic. Somebody with the appropriate computer software is hereby invited to display what results these methods give them. Apparently the guy standing to our left of the door is the person called "Tie Man" on that thread. Note how short he looks. 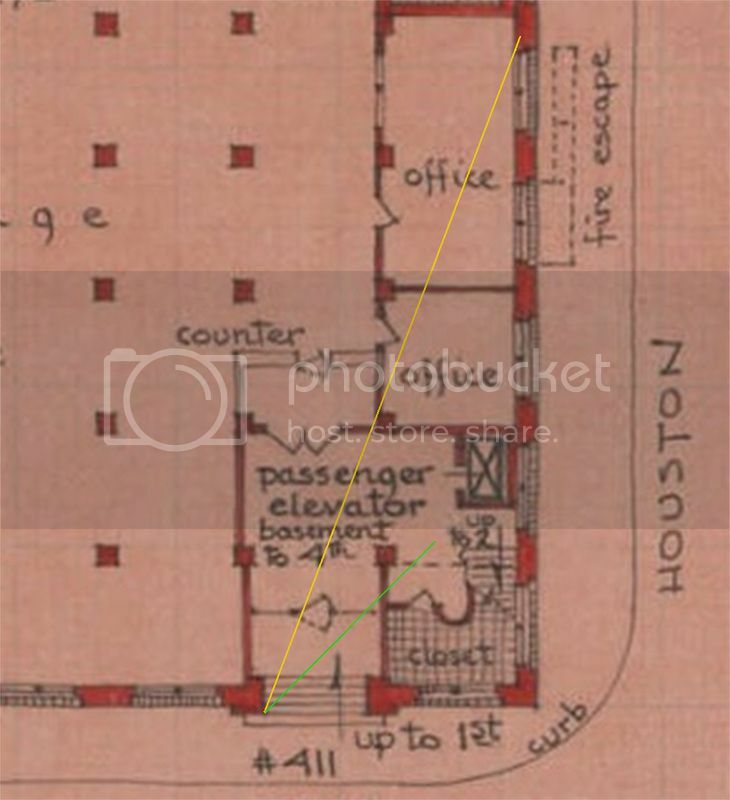 I've read just a few posts on that thread, but was able to gather that (as I understand it) Albert Doyle disputes the analysis, asserting that Prayer Person was standing much closer to the front of the landing, as is Buell Frazier. (Being closer to the camera makes a person look taller due to perspective.) Albert's proof is that the sun is hitting PP's hand (or something he is holding? ), thus causing the "bright spot," something that could not happen if he were standing back near the glass entryway. This is a very easy argument to understand. Please let me know if I got it wrong. Assuming I am understanding this correctly, then whether or not PP is a woman (or a very short man) hinges on whether or not the bright spot on PP's hand is due to sunlight hitting it. It is that simple. Can you tell me what proof or line of reasoning Albert Doyle uses to conclude that the bright spot on PP's hand is due to it being exposed to direct sunlight? To me it appears obvious that Prayer Man is not standing at the front of the landing. He appears much further back on the landing than BWF hence all that noise ^^^ regarding his height is null and void. The sooner the 4K/8k scans are available the better. ***EDIT: You need to keep in mind that the dark shape in front of prayer mans left side (right side from our perspective) is the body/dress of a lady. This gives the illusion of being part of Prayer Man which tricks your mind into thinking he is at the front of the landing. He doesn't have any "proof". It's an assumption- similar to his promotion of the "buttons" theory. off top of head : One way to look at it is that the closer the figure is to the corner the less of it is obscured. iow. If it is LHO then knowing his shoulder width and the location of the camera it should be possible to work out where the figure is with a set shoulder width by working out how much of the backgound is obscured. ? Possible distance(70ft) from camera to bottom steps.